This is a fairly quick, easy and oh so flavorful meal. It requires minimal ingredients, prep and just two pans. 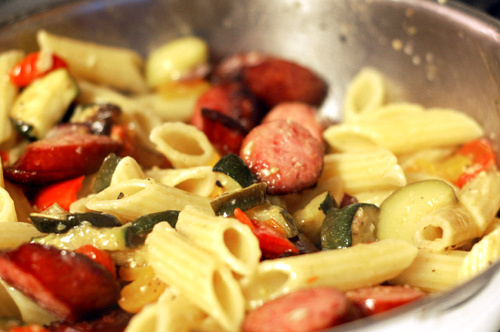 The vegetables and sausage are oven-roasted and then they are quickly combined with the cooked penne to form a simple sauce. Oh, and it's pretty darn healthy, too. 3 small Zucchini, cut lengthwise and sliced to 1/2"
1 Red bell pepper, seeded and chopped to 3/4"
1 Orange bell pepper, seeded and chopped to 3/4"
1/2 med Red onion, chopped to 3/4"
Mix all of the vegetables, garlic, olive oil, salt and pepper well in a large mixing bowl. Spread the vegetable mixture evenly on a large sheet pan. Roast the vegetables on the middle oven rack for 15 minutes. Add the sausage to the top of the vegetables and roast another 20 minutes. Cook the pasta according to the package directions, reserving 1 1/2 cup of the cooking liquid. Turn the oven to broil, crack the oven door, and continue roasting the sausage and vegetables another five minutes. 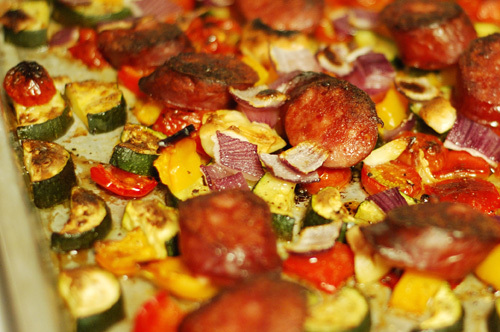 Remove the vegetables and sausage and set the pan aside. Remove the roasted garlic cloves from the roasting pan, smash to a paste with the side of a knife and add to the reserved pasta cooking liquid. Return the pasta to the pot it was cooked in over medium heat. Add the butter, wine, reserved cooking water, sausage and vegetables to the pasta. Stir the pasta gently and cook until the liquid is about 3/4 absorbed.